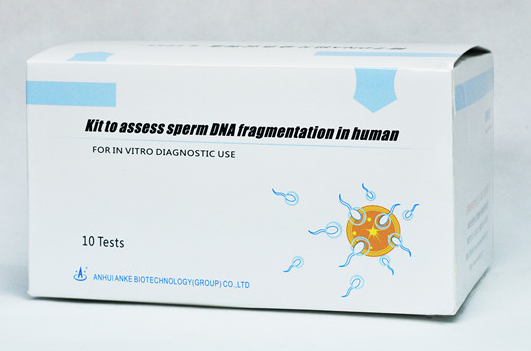 Sperm DNA fragmentation shape staining is used for the evaluation of sperm function to evaluate male fertility. The kit can be used for the evaluation of sperm function and male fertility. Fresh or frozen sperm is stained after dealt with schizolysis and denaturation, sperm with big halo without fragmentation, sperm with moderate halo, sperm with little halo with fragmentation and without halo, degenerative sperm can be observed. Solution A, Solution B, Solution C, Solution D, Solution E and primed slide. Sperm with big halo without fragmentation, sperm with moderate halo, sperm with little halo with fragmentation and without halo, degenerative sperm can be observed. Staining time should be prolonged if room temperature is too low. [The registration Number of Medical Devices] GSYJX (Z) Z2012N1400173.